If you have dogs, then you are definitely going to need somewhere to store their food. Getting a dog food container is much more preferable to keeping dog food in the bag. For one thing, food stays fresh longer when you put it into a container, and dogs have a much harder time getting into the food when it is secured in a container. Plus, a food container simply prevents situations like the bag of dog food getting tipped over and dog food spreading everywhere in your kitchen – into corners and crevices that will make it impossible to gather it all up. These are just a few advantages of having a dog container and this buying guide will help you choose one. Here are the top five dog food containers on the market. These have been selected so that you can have a choice between the most durable and fully-featured dog food containers and the ones that are the most budget friendly. Let’s look at each of them in greater detail. 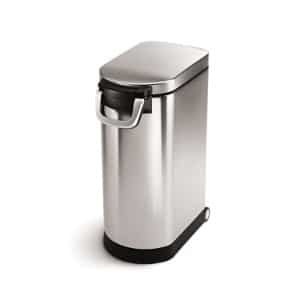 This Simplehuman storage container is a beautiful brushed stainless steel food container that not only looks great in your home but also keeps your pet food secure and fresh. 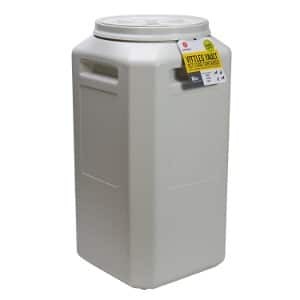 This unit comes in three different sizes including a 25 liter, a 30 liter in a 40 liter. It features a large ergonomic handle that locks so that the lid is completely shut if your dog tries to pry it open. This locking lid forms an airtight seal that keeps the food fresh for weeks or months to come. Plus, since it has a slim and stylish design, you can fit it anywhere in your kitchen and it will look just like any other storage container. 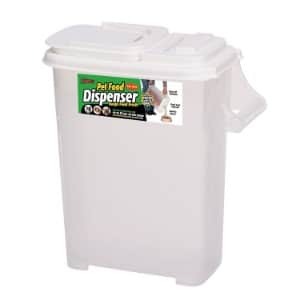 A 30-liter container can hold about 30 pounds of dry dog food, and this unit has a plastic bucket on the inside that is BPA free and removable so it can easily be cleaned after you fill it up and empty it out; you can remove the bucket and spray it with your garden hose or kitchen sprayer nozzle to clean the crumbs and dog food dust that has been left behind. There is even a scoop mounted on the inside of the lid so it is always out of the way and stays clean without collecting any bacteria or contaminants – but is always ready for you to scoop the food into your dog’s bowl. This unit also comes with a 10 year warranty. If you are looking for a terrific and stylish looking dog food storage container, then this might be exactly what the doctor ordered. There are plenty of plastic storage containers on the market, but if you are going to get something that is permanent and will look great in your kitchen, then you might as well go with the stainless steel container, particularly if it has all of the same features that this one provides. This storage container may cost a little more than some of the plastic ones out there, but it does come with a 10 year warranty and will probably last you the rest of your life. From Vittles Vault, this stackable dog food storage container comes in several different types so that you can get the one that you need for the type of dog food that you buy. This will depend upon your dog and how much he or she eats. Some of the different capacities that these are offered and include the five pound capacity – as well as a five pound capacity two-pack – the 30-pound capacity, the 40-pound capacity, the 50 pound and the 80-pound capacity. The great thing is most of these can stack on top of each other. For example, the 40, 50 and 80 as well as the 30 can all stack which means that if you have different pets that prefer different types of food, you will still be able to store all of their food in one place without taking up too much room in your kitchen. The stackable part is all the same on these sizes, and they just get taller the more capacity they have. However, the fact that they are stackable and come in so many different sizes is just a couple of the benefits that these dog food storage containers provide. These containers also are completely airtight and keep your food fresh for a long time. In addition, there is no odor from your pet food because it keeps that contained as well, and these containers are made to be durable and tough. Your pet is not going to be able to open one up and they are not going to break open and spill out everywhere if they get knocked over. They are made of FDA-approved materials but provide easy access with a handle that you can turn when you want to get dog food out. Thanks to the see-through design, you can even see what kind of food is in there if you forget which food is stored in which container. This is a 3-piece airtight storage container from IRIS that will definitely work as a terrific dog food storage device because it comes with everything that you need to keep your dog happy. 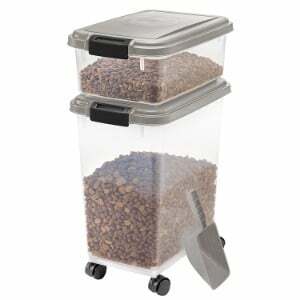 The three pieces that this container comes with refers to the large storage box, the smaller storage box and the scoop. The large storage box is on the bottom and it comes with wheels so that you are able to wheel around your kitchen or wherever you store your dog food and easily get at the food inside when you need it. There is also a smaller box that stacks on top that allows you to put in a different type of food or dog treats. This food container combo comes in nine different colors including blue moon, dark gray, dark green, green, navy blue, pink, red, seafoam and chrome. It is a plastic airtight container with two different units that is perfect for anyone that has dogs or even people that have dogs and cats. That’s because you can store dog food in the bottom and cat food in the top. The top container holds 12 quarts of food while the bottom container holds 33 quarts of food. That means that you are able to easily fit a 25-pound bag in the bottom container and a 10-pound bag in the top container so you will have food for several weeks all in a place where it is going to stay fresh and not spoil. When you have storage containers like this, you do not have to worry about moisture or mold, and since this is made out of BPA-free plastic and comes with easy wheels and a stable design that permit you to roll it out from your pantry or another part of the house to feed your dog, there is no doubt that this is one of the best dog food storage containers on the market. It even comes with a scoop that you can store inside either of the containers or on top. Plus, these storage containers are translucent so you can see what dog food is inside if you ever forget what you have stored in there. 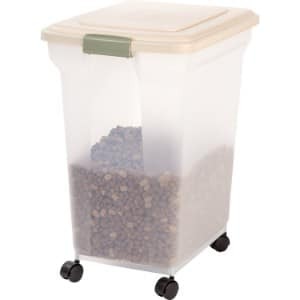 This fresh storage container from Buddeez stores both dog and cat food easily, and it comes in several different forms so that you can save a little bit of money if you buy more than one. You can buy the single, or you can go with the two-pack, three-pack, four-pack or even a five-pack for maximum savings. These storage containers are perfect for those who are looking for a deal because they are our budget pick due to them costing about what you might pay for a meal for two at a fast food restaurant. But that is not all that is great about these food containers. They are specifically designed for a 12-pound bag of food, and you can either pour the food into the container, or you can simply just set the bag inside the container and open up the top. In either case, you’re going to be able to keep the food fresh and dry, and be able to access it whenever you want. These storage containers are terrific because they are small and stylish and you can fit several of them in your pantry so even if you have cats and dogs or dogs that like different food, you are going to be able to accommodate everyone with simple and inexpensive dog food storage containers. Just because these are budget storage containers doesn’t mean that they are not worth getting. These are strong and airtight and your dog is not going to be able to knock them over and spill the food. Plus, for a human, these are really easy to access and you can simply fit your dog bowl inside and fill it up whenever you choose. If you like simplicity and value in your dog food storage containers, then they should definitely be a top contender for your choice. Another IRIS entry is this premium, airtight storage container comes in lots of different sizes and even a few different colors. As far as sizes go, you can choose from six pounds, 12.5 pounds, 22 pounds, 42 pounds and 55 pounds. These are all the right capacity to fit standard size dog food bags and some cat food bags. The colors that these storage containers come in include almond, navy, white, smoke and forest green, but they are still translucent enough for you to be able to see the dog food inside. These premium airtight plastic food containers are terrific when it comes to being able to store food securely and access it easily. You have to strike a balance between food that is completely secured within these containers and food that is easily accessible. But the benefit of these food containers is that there is a handle that you can easily lift with one hand and then the lid rises up while still on its track to allow you access to the food inside without falling off. Plus, these storage bins are tapered to make them easy to clean and get that very last scoop of food from. In addition, these are rolling storage areas that will allow you to store them inside of your pantry or anywhere else in the house and roll them out whenever you need them. No longer do you need to lug out big bags of food in order to fill your dog bowls. Plus, these food containers are priced for value and are going to last you for a very long time. You get plenty of space to store food, easy to access containers and airtight storage that allows you to store food for months without losing its freshness with these IRIS pet food storage containers. In order to purchase the best dog food storage container, you’re going to need to know what type of dog food you plan on storing, how far away from your dog bowl or automatic dog feeder the storage container is going to be and lots of other factors. This buying guide was designed to give you the information that you need to make the right purchase decision. There are lots of features associated with dog food storage containers, and you should understand what is available before you begin shopping. Making the best buying choice is never easy but with the right information you can get the dog food storage container that you need. Just like with any of the other accessories that you get for your dog such as indestructible dog beds, electronic dog door, a pooper scooper and poop bag, safety accessories like a dog gate and dog camera or even dog transportation such as a dog bike trailers, a dog stroller or a dog seatbelt and dog car seat cover for your car, you want to evaluate all aspects of the product carefully including features, construction materials, proper usage and lots of other stuff. That’s exactly what this dog food container buying guide is supposed to guide you through. First, let’s discuss how you store dog food properly. Most people store their dog food indoors rather than next to the outdoor dog kennel or dog house, and the reason for that is that dog food bags do not hold up to the weather and dog food can mold or spoil if it gets wet. Dog food can also go stale if left indoors in a bag for long periods. Plus, there is the issue of security. You don’t want your dog to be able to get into the dog food when you are not there, and it can be pretty easy for them to rip open bags of food that are not locked away in a closet or on a high shelf. That’s why dog food containers are considered by many pet experts to be the best way to store dog food properly. There are several different types of dog food storage containers that you should know about, with different materials and different uses or features. Let’s take a look at each of them individually so that you can see which one might be perfect for your dog food storage needs. Plastic storage containers can be great, but with some containers, dogs can bite and chew the lid until they are able to access the food. You can use deterrents like anti-chew dog spray in some cases, but the better idea is to simply get plastic storage containers that are going to be secure and will prevent your dog from getting into them. That means choosing plastic containers with lids that lock into place. Plastic works really well for storing dog food because it is an inexpensive material and it keeps moisture from getting in. In addition, plastic containers are usually translucent so that you can see the dog food inside in case you forget what you have stored in a particular container. Plastic is definitely the most common material the dog food storage containers are made out of. Metal dog storage containers have advantages and disadvantages as well. Advantages of metal storage containers include the fact that they are much more stylish and attractive than plastic containers; plus they are better for the environment. However, metal storage containers are usually more expensive than plastic ones, and you should get something like stainless steel otherwise you have to deal with rusting. Very few metal storage containers are not constructed from stainless steel, so this is a rarely a concern. Metal storage containers are really attractive and will look great with any modern or post-modern design. If your storage containers are going to be out in the public eye, then you might want to consider going with metal. There are some storage containers that are made of wood as well, and they can have their advantages, but there are also some pretty significant disadvantages with wooden storage boxes as well. When it comes to dry dog food containers, the goal of food storage is to keep them secure from your dog, keep the food fresh and prevent moisture from getting in. If you store your dog food indoors, moisture is rarely a concern, but getting stale is definitely a possibility if you store dog food long term. Unfortunately, wooden dry dog food storage does not usually offer an airtight seal. However, these containers can be extremely decorative and beautiful and you can keep your dog food in the bag to keep it fresh longer. Another type of feature that you want to look for is one that we have already discussed. Airtight dog food storage containers are the best way to keep dog food from going stale. These containers usually have some sort of a seal that traps the air inside the container and does not let it escape. Generally, plastic food storage containers are the best dog food storage container airtight models that you can get, but if you are looking for a heavy-duty dog food container, there are some stainless steel dog food containers out there that provide an airtight seal. You will just have to pay more for them. Stackable dog food containers offer a major advantage that other types of containers do not. Since you can stack them on top of one another, you can store lots of different types of food. This is perfect for the family that has lots of dogs and cats that may enjoy several different types of food. Stackable containers allow you to take up very little storage space while still dividing your dog and cat food up into different bins that you can then open when you need to refill food dishes. Many plastic dry dog food containers are stackable, even the ones that are made to fit different capacities. Dog storage containers that are portable also offer a pretty unique advantage to the dog owner, namely that you can wheel them around the house without having to pick them up and carry them. These portable dog food storage containers are usually equipped with wheels and a stable design that prevents them from tipping over when they are full of product and you are wheeling them around the house. The casters work just as well on carpet as they do on linoleum, and you can take them outside in the garage or anywhere else that you need to go to fill up your dog’s food bowls. This can be useful in many ways, like being able to bring your dog’s food to the bowl instead of the other way around. If your dog’s food bowl is a two compartment bowl that also has water in it, you don’t want to be dumping out water every time you want to refill it. Something else that you will need to look at is the size of your dog food container. Usually, dog food containers are designed to fit standard size bags of dog food. That means that the best dog food storage container for the type of dog food that you can’t will be based upon the weight of the dog food bag. Then, the storage containers that you look at will tell you the capacity and then you can use that to determine what size dog bag is going to fit best in it. Some storage containers will actually allow you to put the entire bag in which helps keep it even fresher while others will require that you pour the dog food into the container. Ease of access and use are other considerations that you should think about. How easy the dog food container is to get open and get at the dog food inside is definitely something to check before you buy. Some dog food containers come with their own scoop in some of them even have some sort of mount on the inside of the lid or the outside of the container where you can put the scoop. This is a great feature because using a scoop for your dog food rather than dipping the dog food bowl into the food is much more hygienic, and your only other alternative is to use a cup or bowl from your kitchen. You also want to make sure that the lid opens easily and closes just as quickly. Being able to use the container without a challenge is an important factor because having to pry the lid off of the container each time will quickly become a pain. The bottom line is that there are plenty of things to consider when it comes to choosing the right dog food container. You have to look at all of the different materials that dog food containers are made from and decide which best suits your purposes. You also have to decide whether you want your dog food container to be portable, whether it has to be airtight and how much capacity you need. In addition, you need to make sure that you can get into it easily when you need to refill your dog’s bowl. This buying guide should give you the information that you need to choose the perfect dog food container as well as some solid recommendations and reviews on the top five dog food containers. You will have plenty of information with which to make your decisions.